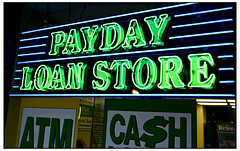 Payday loans have sometimes been described as “legalized loan sharking”, because lenders often charge big fees and interest rates to make large profits. It can be difficult to find a reliable and trustworthy payday lender that is willing to cut you a good deal on your loan. Still, there are some ways that you can avoid payday loan sharks that charge excessively high interest rates. Before you start looking for good deals, it’s important to understand how payday lending works. Get yourself as familiar as possible with the payday lending system so you know what the advantages and drawbacks of payday borrowing are. Educate yourself on the payday lending system and get an idea of the types of payday loans that are available, so you can make well informed decisions. Step 2. Do some market research. Now that you know how everything works, you can start doing some market research. Get information on some of the payday lenders that service your area. Look online for some comments and reviews on these lenders. Remember, the Internet is a strong tool, so use it to the best of your advantage. The reviews of other people help in choosing a lender that is reliable and won’t charge you sky-high rates. After doing your research on the companies out there, it’s time to make your decision and choose the company that can give you the best deals and the best services. Remember, the deals that you get will differ from one lender to the next, so do some negotiating and try to talk your way to better deals. When choosing your lender and payday loan package, take into consideration all of the fees, penalties, terms, conditions, rates, and most importantly, your ability to pay off the loan. By weighing the risks involved, you can come up with a good plan of settling the payday loan on time or in less time. This way, the expensive interest rates won’t eat much of your budget.